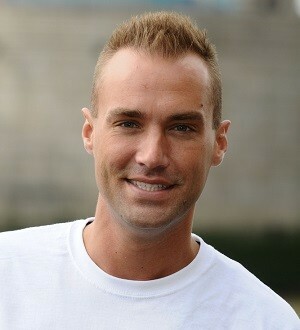 Calum Best has had two hair transplants. The Mail Online recently reported that Calum Best – sometime model and actor, most famous for being the son of George Best and bedding celebrity women – is headed for his third hair transplant in two years. And he’s not alone. Wayne Rooney, Phil Tufnell and James Nesbitt are just three other celebrities who have recently had hair transplants. Similar to Best, Rooney has gone under the knife twice in the past three years. With so many celebrities going public about their transplants, some men – and indeed, some women – might find themselves seriously tempted to go down the surgery route too. There’s no denying that losing your hair, especially from a young age, can be a hugely distressing thing to go through. Male pattern baldness, the most common cause of hair loss, affects 6.5 million men in the UK and is caused by over-sensitivity to the hormone dihydrotestosterone (DHT), which causes hair follicles to shrink and stop functioning. Because of the role played by testosterone, a popular myth abounds that baldness in males is an indication of virility. Of course, this is not a great comfort to those men made miserable by their hair loss on a daily basis. Celebrity hairdresser James Brown coped with his burgeoning bald spot by wearing hats 24/7, and found that when going through an airport – a common activity for someone with his jetsetting lifestyle – he would panic about having to reveal his hair loss: “Those minutes before going through security and taking my hat off, they were torture for me”. Like many others in his position, Brown decided he had had enough and sought out professional help, settling on the Dublin-based hair transplant clinic Hair Restoration Blackrock (HRBR). After a successful procedure, Brown went public about how delighted he was with the results of his transplant, calling it “incredible” – tempting, no doubt, scores of men to seek out the same treatment. The type of surgery Brown underwent is called an Ultra Refined Follicular Unit Transplantation, and – despite the intimidating name – abides by a simple principle, indeed the same principle as any other hair transplant: hair follicles that are genetically resistant to balding are taken from a “donor” area of your head (typically the back) and implanted into the bald patch. After surgery, the newly introduced follicles should grow as normal and, provided the donor patch was healthy, not fall foul of the effects of DHT. So how much does a hair transplant cost? Well, do a little research and you’ll find that most hair transplant clinics are reticent about stating such things on their website – due in part to the fact that prices will vary depending on the nature of the transplant needed. But affordability is also a key factor. James Brown’s clinic of choice, HRBR, doesn’t give examples of surgery costs but does cautiously state: if cost is the main factor influencing the decision about whether or not to proceed with hair transplantation, we would strongly advise patients against surgery. If cost is the main factor influencing the decision about whether or not to proceed with hair transplantation, we would strongly advise patients against surgery. Generally speaking, the price tag on a hair transplant is decided by two things: the number of grafts (which each contain 2 to 3 hairs) implanted, and the technique used. To give you an idea of how much it could add up to: a hair transplant might implant around 3000 grafts, with each graft normally priced at £2 to £10 (HRBR charges 10€ per graft). The bottom line? You can expect the starting price for a hair transplant of 3000 grafts, resulting in the implantation of 6000 to 9000 hairs, to be around £6000 (incidentally, the amount that Best has declared his next transplant is costing him). For many people, paying £6000 to get back a full head of hair seems like a no-brainer. But there are some considerations to be taken into account before taking the leap – such as the fact that a hair transplant can often leave scars in the area where donor follicles were taken. The main consideration, however, is that – as evidenced by both Best and Rooney – one hair transplant procedure is not always a lasting solution to hair loss. The younger you are, and the more severe your hair loss, the more likely it is that you will continue to lose hair after a transplant. There is also more risk involved when it comes to choosing a donor site in young men; if a surgeon takes donor hair from an area that is not genetically resistant to hair loss, then the transplant will ultimately fail. In fact – and rather unfairly – the types of men best-suited to a hair transplant are those in middle-age, with only moderate hair loss. The conclusion seems to be that for young men experiencing rapid hair loss, a hair transplant is unlikely to be a viable solution. For those who are slightly older, with more moderate hair loss, a transplant can work well – particularly if you are willing to shell out for more than one procedure. For everyone else experiencing hair loss who is reluctant to spend thousands on surgery, there are other options in the form of prescription hair loss treatments, such as Propecia (or its generic form Finasteride), or over-the-counter treatments such as minoxidil (a well-known brand is Regaine). Bear in mind, though, that these sorts of treatments must be taken on a long-term basis and – once stopped – hair loss can often resume. To conclude: is a hair transplant really worth the cost? It looks like for some men, yes. And for others? Well, shaving it all off and embracing your bald head might be the best thing you could do for yourself – and indeed, your wallet.